This is to inform all the fresh students of the Obafemi Awolowo University (OAU) that the management of the institution has announced the orientation programme schedule for 2018/2019 session. 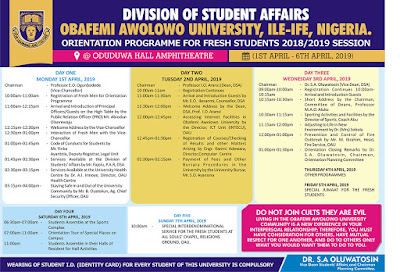 OAU Orientation programme ceremony will hold between 1st April and 6th April, 2019. 12:00pm-12:45pm – Accessing Internet Facilities in Obafemi Awolowo University by the Director, ICT Unit (INTECU), OAU. 10:00am – SPECIAL INTERDENOMINATIONAL SERVICE FOR THE FRESH STUDENTS AT ALL SOULS’ CHAPEL RELIGIONS GROUND, OAU. DO NOT JOIN CULTS THEY ARE EVIL LIVING IN THE OBAFEMI AWOLOWO UNIVERSITY COMMUNITY IS A NEW EXPERIENCE IN YOUR INTERPERSONAL RELATIONSHIP; THEREFORE, YOU MUST HAVE CONSIDERATION FOR OTHERS, HAVE MUTUAL RESPECT FOR ONE ANOTHER, AND DO TO OTHERS ONLY WHAT YOU WOULD WANT THEM TO DO TO YOU. Vice Dean Students Affairs and Chairman Planning Committee.